I was delighted when I received an email in which I was asked to review ETA Hand2Mind Versatiles Readiness product! I have seen this neat teaching tool at conferences over the years and have even taken home a few free samples to try out! Years ago, I tried them out with my class, and I have been drooling over them ever since! 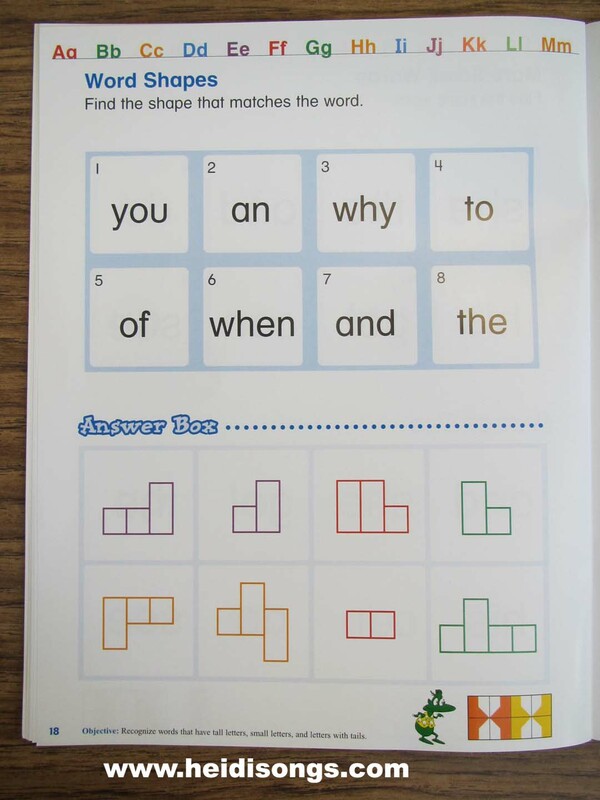 If my class had had any budget at all, I would have happily bought a set for them to use as an independent center. So it was with great pleasure that I readily agreed to try out and review the Versatiles Readiness Kit! When I received the kit in the mail, I was glad to see that there was a variety of books included that covered all of the basic subject areas. 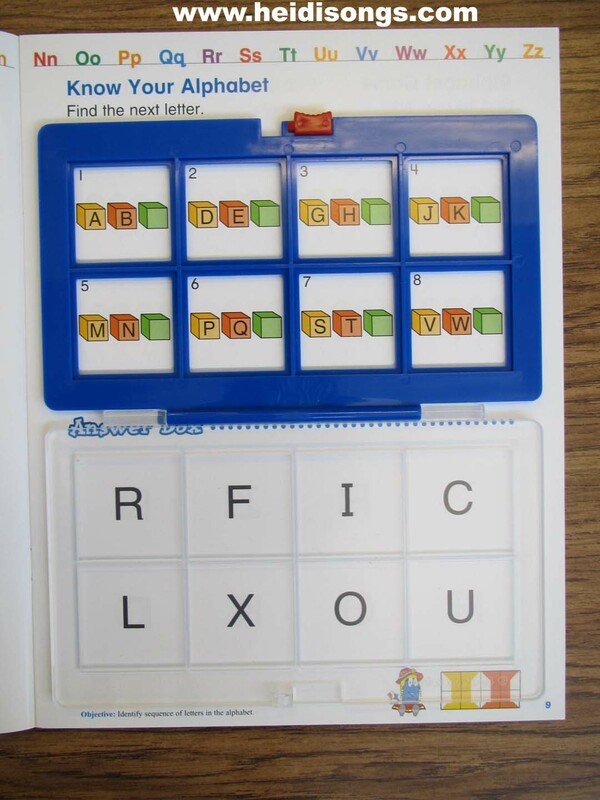 It also starts out easy enough for all children to complete, such as simple letter and word matching for Kindergartners and Pre-Kinders. 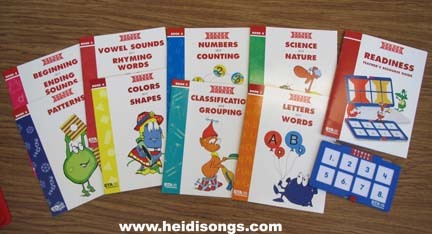 Versatiles Readiness Kit for Pre-K and Kindergarten- the GIVEAWAY includes this entire kit!!!! The kit includes books with lots of subject areas, and topics include science and nature, letters and words, numbers and counting, classification and grouping, colors and shapes, vowel sounds and rhyming words, beginning and ending sounds, and patterning. I actually took the kit to a friend’s house, and she was nice enough to lend me her kids for a while so I could see how they did with the Versatiles. Her son had just finished Kindergarten, and her daughter was four years old, and just ready to start Pre-K. They both were very happy with the set, and only stopped playing with it because it was time to get in the pool! The little boy that had finished Kindergarten, though, found it to be a little bit too easy, so for first graders it is probably better to switch to the regular Versatiles set rather than the Readiness set. Working together, they did not need my help with it at all, other than to show them how the first one worked. These are my friend’s children, playing with the Versatiles Readiness Set. 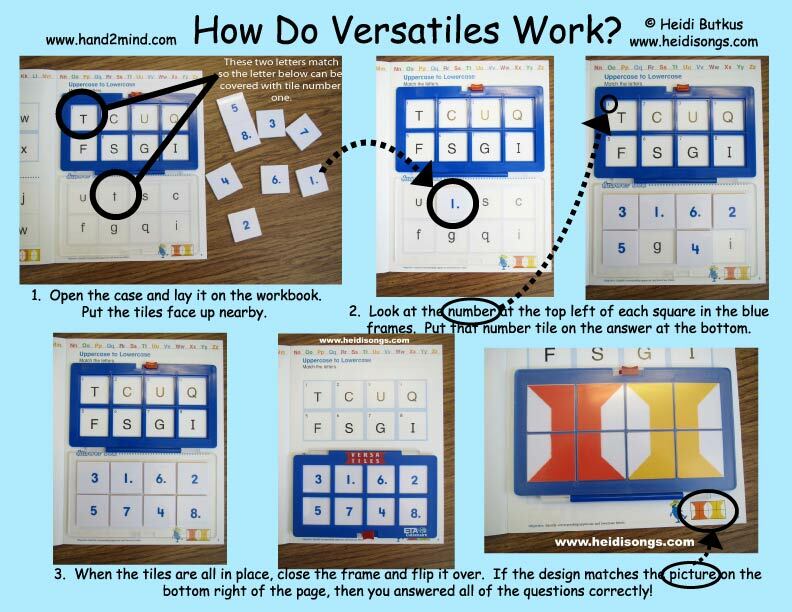 I bet you are wondering what this Versatiles Set does, and how you work it! Well, now, that IS a good question! The graphic below should help, hopefully! 1. Open the case and lay it on the workbook. Place the tiles face up nearby. 2. Look at the number at the top left of the each square in the blue frames. Put that number tile on the answer box at the bottom. 3. When the tiles are all in place, close the frame and snap the red lock tight. Then flip it over to reveal the design the tiles made on the back. 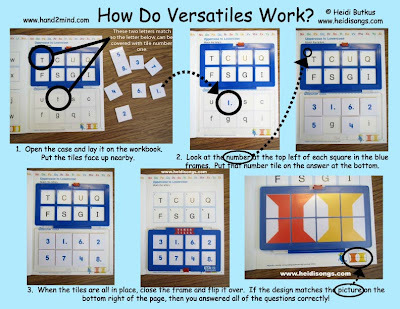 If your design matches the one on the picture, then you completed your Versatiles worksheet correctly! If not, back up and try it again. 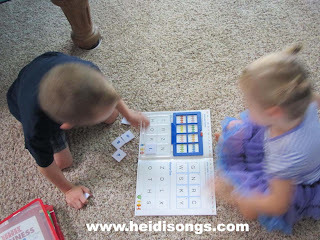 The only parts that these two children had trouble with, once I showed them the first one and how it worked, was being able to read the directions at the top of the page. 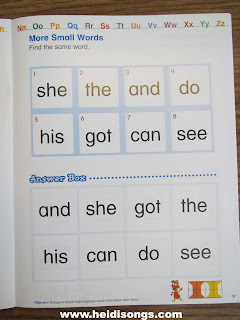 Some of the pages are very intuitive, and children can just take a guess and probably get it right. Others will need some explanation until the children can read. 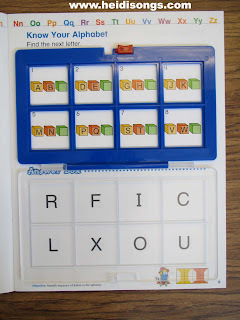 The other thing that happened was that when the little boy turned the case over, he flipped it the wrong way and then the design on the tiles didn’t exactly match, because it was backwards. It was close, it was just backwards- even though he had gotten all of the answers right. Once I showed him which way to turn the case over, he was fine after that. Those were the only issues at all, and they were easily solved! 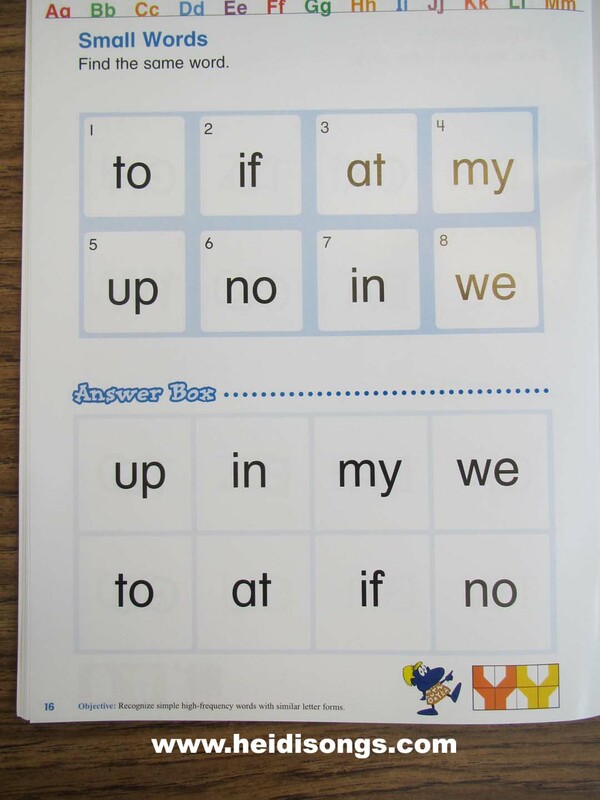 A page from the Letters and Words Readiness book. 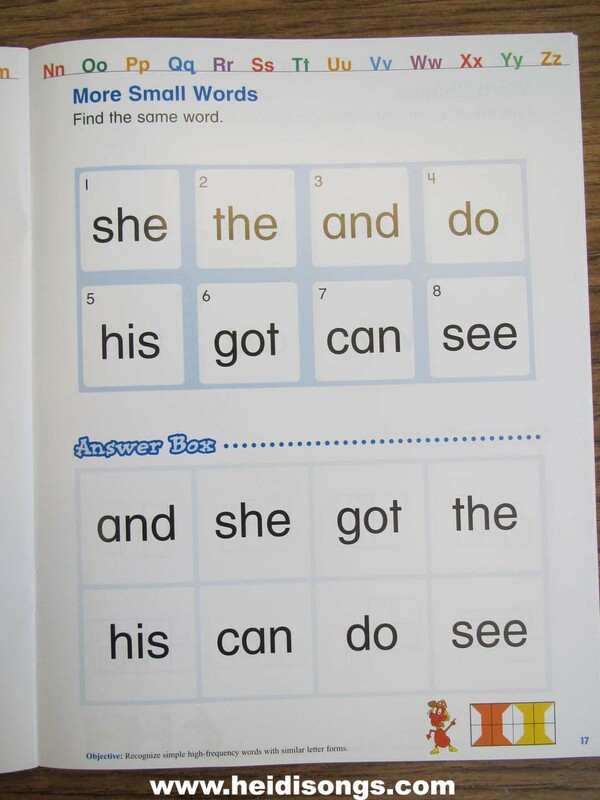 In this page, they just match the words that are the same. 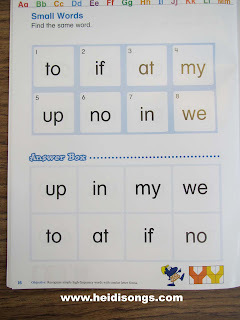 On this sight word page, all they have to do again is match the words that are the same. 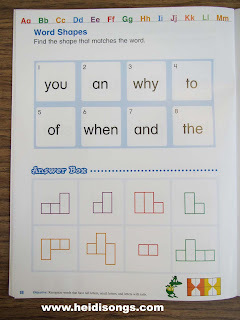 Children must find the matching word shape on this page. 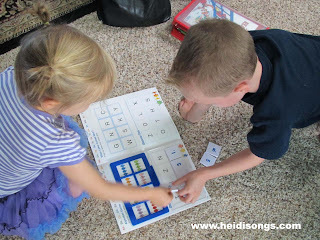 Overall, I was very pleased with this kit and all of the things that my kids would be able to do with it independently! I just wish it came with a few more cases and tile sets so that I could use it with more children at a time! I love the fact that it is independent and self checking. The kids loved it and thought it was “cool” and “radical!! !” That’s a pretty big compliment, coming from a couple of little ones that could have been in a swimming pool on a very hot summer day! If you would like to enter into this giveaway of this entire kit, please leave a comment on my blog with your email address. Sign up to become a follower of this blog, and sign up for the email updates. The contest will end on August 25th. Winners MUST live within the United States, as ETA cannot ship internationally. Did you enjoy this post? Follow this blog by signing up email updates, or follow on Bloglovin’. You can also follow me on TPT! I’m also on Pinterest, Facebook, Twitter, Google+ and YouTube, too! Don’t forget to sign up for our email newsletter (on the left sidebar) for special deals and promo codes that you won’t find out about anywhere else.